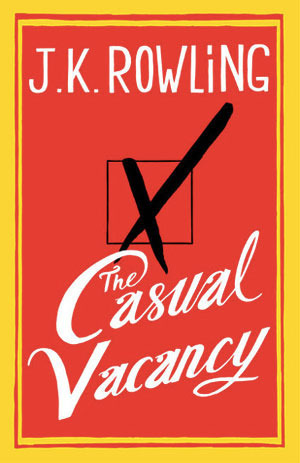 Fans of J.K. Rowling’s ‘Casual Vacancy’, beware! The book is being adapted into a tv series by BBC One, in association with HBO. The cast includes Michael Gambon, Keeley Hawes, Rory Kinnear, Monica Dolan, Julia McKenzie, and introduces Abigail Lawrie. The miniseries comprises three one-hour episodes. It is scheduled to debut on HBO on 29th of April with two back-to-back episodes. The third episode will be screened on 30th of April. Rich at war with poor, teenagers at war with their parents, wives at war with their husbands, teachers at war with their pupils … Pagford is not what it first seems. And the empty seat left by Barry on the parish council soon becomes the catalyst for the biggest war the town has yet seen. Who will triumph in an election fraught with passion, duplicity and unexpected revelations? The slidewhow briefly describes the methodology used to collate data. It also gives insights on different types of book buyers: 1) adult fiction, 2) young adult (YA) fiction, and 3) adult non-fiction. If you would like to market an adult fiction for example ‘Gone Girl’ by Gillian Flynn, target 1) bestseller list, 2) places of work/study, and/or 3) reading group. Adult fiction readers are more likely to discover the book through those methods. YA fiction readers are, in general, avid users of social media e.g. Facebook, Twitter, Instagram and Goodreads. Therefore optimise the use of social media when you promote a YA fiction book. Research has also shown that YA fiction readers are more likely to discover the books through film, television and/or radio adaptation. Are you trying to attract older women who lives in the country/rural areas to buy adult non-fiction books? The best way to reach them is via printed newspapers. If you are author/bookseller/publisher, it might be best to invest in these book consumer data. For more details, visit Nielsen Market Research‘s online store. As next week marks the hundredth anniversary of Dylan Thomas’ birth, British Council Wales’ Starless and Bible Black project and the British Council Seminar Series are proud to bring a free seminar to be held in London and streamed live online TODAY. The special guest speaker for this event is Hannah Ellis, granddaughter of Dylan Thomas. She will give an exclusive talk about her grandfather’s life journey. Together with accomplished actor Guy Masterson, they will explore Dylan Thomas’s letters, prose, poetry, plays and use of language. In addition, British Council will launch their Dylan Thomas teaching materials for the English language classroom. You could attend IN PERSON or LIVE ONLINE. To get a spot at this event, visit this link. Get your Dylan Thomas education pack by clicking here. Have you ever wanted to stay overnight in a bookstore? Dream no more! 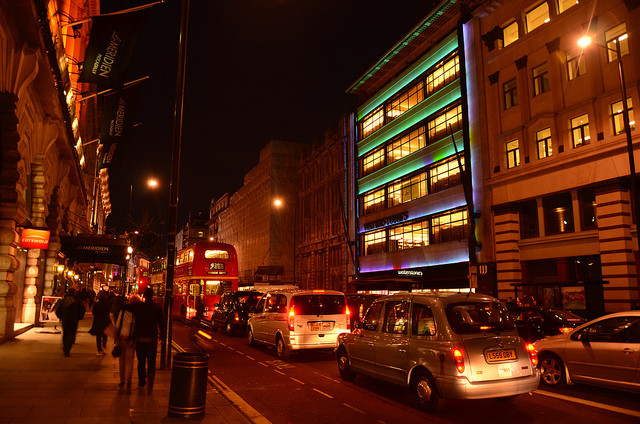 Waterstones is organising a sleepover in Piccadilly store (London) on 24th of October 2014. This event is inspired by an incident where a tourist got locked in Trafalgar Square store last Thursday. He was rescued only after tweeting about his situation (see below). Hi @Waterstones I've been locked inside of your Trafalgar Square bookstore for 2 hours now. Please let me out. The incident became a hot topic online. Many people wrote that they would love to spend a night surrounded by their favourite books. This caught the attention of Airbnb UK, who later presented the idea to Waterstones. @Airbnb_uk @IKEA @DWill_ Hey, so sorry to miss this – wow we had a lot of tweets today! This could be fun – let's talk! It’s amazing that ‘Night at Waterstones’ was formed within a week of discussion! ‘Night at Waterstones’ is only open to ten lucky guests and their friends (each guest can bring one friend along). It will kick off at 9 pm on Friday and end at 9 am on Saturday. Guests will be welcomed with a tour of the store (did you know that there are 150,000 titles in store?). They will also have access to free WiFi, entertainment, bedding and most important of all, food! To enter the competition, visit Airbnb, create an account and answer this question “What book you would read if you were to spend the night in a bookshop, and why?”. Submit your entry before UK midday on Wednesday 22nd October. Some of us aren’t able to participate due to our geographical limitations. Despite that, I would like to know your thoughts on the sleepover. If you were to spend the night in a bookshop, what book would you read and why? 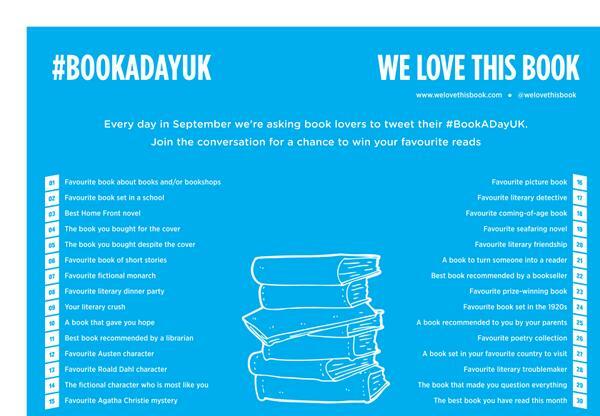 If you have a Twitter account, you should search for #bookadayuk. The hashtag is basically a UK-originated digital campaign to get people talking about books. There is a topic of discussion everyday and the hashtag is hosted by different book organisation every month. ‘We Love This Book‘ arranged the topics for the month of September. I was impressed by their out-of-the-box method to present tweets from contributors. Instead of clicking on ‘Retweet’ or ‘Favourite’ button, ‘We Love This Book’ compiled and displayed their favourite book suggestions via Storify. I was elated when my suggestions for Favourite Literary Friendship, Favourite Seafaring Novel and Literary Crushes were featured there. On the 1st of October, ‘Books Are My Bag‘ will take over the hosting duty. Check out the image below for a list of topics. 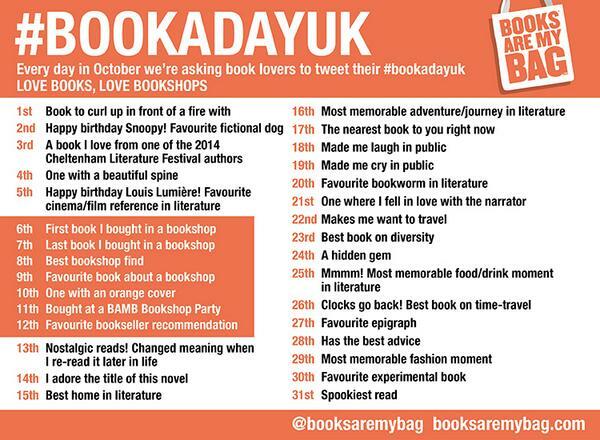 If you would like to contribute ideas, don’t forget to include hashtag #bookadayuk when you tweet to @booksaremybag. What about you? What book do you choose when you want to curl up in front of a fire? Memories define us. So what if you lost yours every time you went to sleep? Your name, your identity, your past, even the people you love — all forgotten overnight. And the one person you trust may only be telling you half the story. 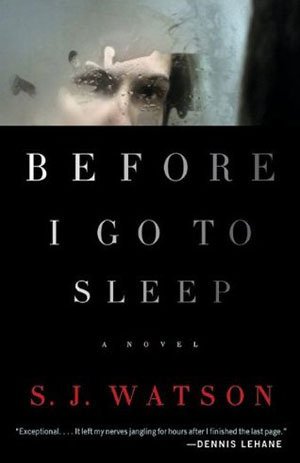 For more information on the novel and book, visit this Facebook page or search for hastag #BeforeIGoToSleep on Twitter. Ever since I discovered hashtag #bookadayuk last month, I have been tweeting my answers to the book chat. It is so fun but challenging at times. Often I refer to ‘My Books’ section at Goodreads to find a suitable book to throw into the discussion. I usually post using @ssreaderscorner but when I have 2 book suggestions, I will use my personal Twitter @emberzmars. My proudest moment was when I was the earliest to answer ‘The Best Young Adult book’ tweet on 19th of August 2014. I am delighted to say that hashtag #bookadayuk will be continued in September. This time, it will be hosted by We Love Books on Twitter (refer to image). To join in the fun, include hashtag #bookadayuk when you tweet your answer to @welovethisbook. Check out our entries on SS Readers Corner’s Twitter timeline on the right side of your screen. For today’s chat, our pick for ‘Favourite book about books and/or bookshop’ is ‘The Perks of Being a Wallflower’ by Stephen Chbosky. Charlie was given a list of books to read by his English teacher named Bill. I like the list and have added a few books to my own ‘To Be Read’ list. What is your choice for ‘Favourite book about books and/or bookshop’? Feel free to share your entries in the comment box below or chat with us via Twitter.